Home of the Woolwich Thrashers. The Canadian Sledge Hockey Championship is coming to Woolwich Township from May 10-12, featuring teams from Ontario, Quebec, British Columbia, and Alberta. We are excited to be hosting this national event, and hope people from across Woolwich, Waterloo Region, and Ontario will come and experience the excitement and exhilaration of Sledge Hockey being played at one of its highest levels. 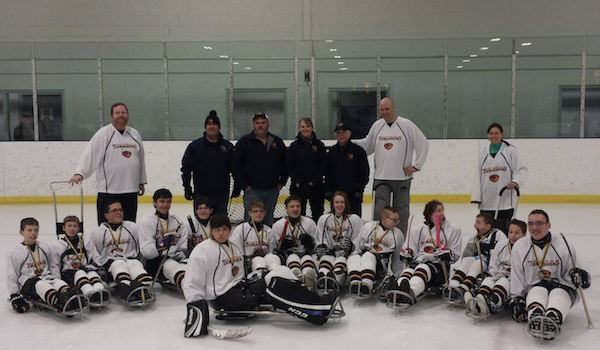 Welcome to Woolwich Sledge Hockey, the home of the Woolwich Thrashers! Thank you for visiting our website. Woolwich Sledge Hockey (WSH) contributes to the development of the sport of sledge hockey through a range of programs designed for persons with physical disabilities. WSH is a member of the Ontario Sledge Hockey Association (OSHA). The objective of the WSH organization is to contribute to the health and well being of people with disabilities by providing opportunities in sledge hockey. Our goal is to work hard to accommodate the individual needs of each participant recognizing the uniqueness of each person with a physical disability and strive to develop them to be the best they can be. WSH is open to any person with a physical disability, young or old! We would love for you to join our team! Thanks To Our Sponsors and Supporters!